This painting of The Assumption of the Virgin Mary is by Rubens, completed in 1626 as an altarpiece for the high altar of the Cathedral of Our Lady, Antwerp, where it remains. 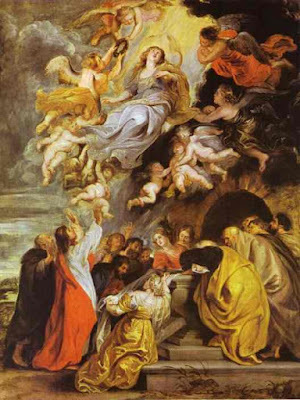 A choir of angels lifts Mary in a spiraling motion toward a burst of divine light. Around her tomb are gathered the 12 apostles — some with their arms raised in awe; others reaching to touch her discarded shroud. The women in the painting are thought to be Mary Magdalene and the Virgin Mary's two sisters. A kneeling woman holds a flower, referring to the lilies that miraculously filled the empty coffin. The Antwerp Cathedral of Our Lady opened a competition for an Assumption altar in 1611. Rubens submitted models, and, 5 years later, he completed the piece. Teaching of the Assumption of Mary became widespread across the Christian world, having been celebrated as early as the 5th century. For many countries around the world today is a national holiday and is celebrated as the feast day of the Assumption of Mary, when God “assumed the Virgin Mary into Heaven” following her death. Many attend church services, there are village festivals, sports events, parades, markets, communal meals and firework displays. In Sao Paulo the feast is known as “Our Lady of the Navigators”. Pageants are held on decorated canoes, each carrying a captain, a purser, three musicians, and two rowers.